Saturday 10th December 4-6pm at St James Church Hall. Join us for our popular annual event! We sing a range of festive songs, from classic carols to secular songs round the piano. Complete with some mince pies, and refreshments to get you into the spirit of the season! Messy Church is a special type of ‘service’ which usually held on a Friday afternoon, however, at Christmas time we hold a very special version on a Sunday morning. This is a very relaxed and family friendly event – we start with refreshments while we take part in crafts suitable for the whole family, there’s story-telling, carol singing and a very special nativity performance by our children’s church. 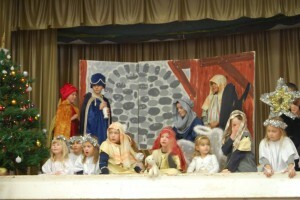 We may even need a few extra angels if your children want to join in! Set in the new School in the community of Lyde Green, we will be singing carols during their Christmas Event. This is sure to be a fab afternoon featuring performances from a range of community groups and activities. 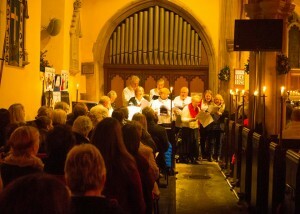 Carols by Candle Light is a very popular annual service – it’s recommended you arrive early to secure a seat! This service includes lessons read by a range of Church members, carols, and performances by our choir and hand bell ringers. 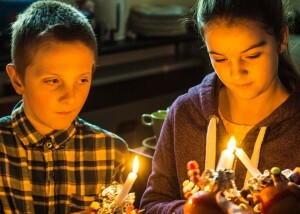 This is a child friendly service, we we distribute and light our Christingle Candles. A beautiful service to really consider the meaning of Christmas. 10:30am A service suitable for the whole family will be celebrated in St James Church.